Are you still using Rhino bullets? I live in Johannesburg and also own a 7x57. I went on a zebra hunt last year, my first and tried using a certain locally manufactured monolithic hollowpoint.I took a shot at about 40 meters and the bullet only penetrated 22 cm!!! I would like to find out more of your experiences please? Elephant, Rhino, Buffalo, Lion, Leopard, Hippo, Croc, All plains game, Tiny ten, Nocturnal species. Elephant, Buffalo, Bush pig, Warthog, Eland, Kudu, Bushbuck, Tiny ten. Use the heaviest for calibre bullets(2200-2400 fps with high sectional density is all you need) in your chosen rifle/calibre and practice until you are competent with that combination. 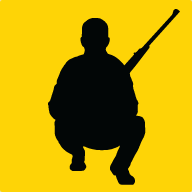 Get any rifle issues sorted out before coming to Africa. The more confident and competent you are with your equipment the better you will hunt. Get a good PH and trust him. Fishing and guiding, just being out in the wild.